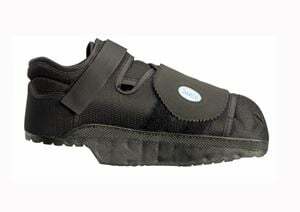 Heel Wedge Shoe by Medline is especially designed to reduce pressure on the heel post surgery. On regular usage, it shifts the weight from the heel part to the middle of the foot for quicker healing. Locking-ankle atrap helps for secure fit. Perfect to correct plantar fasciitis, heel spurs and heel lesions. Can also treat heel infections and heel trauma. Features hook and loop straps that are used to fasten and unfasten easily. I had a heel ulcer and used many products that aren't of much use. My uncle suggested this product and now its completely healed. Thanks to him!! !